Rewards Canada: Finally a new Hyatt Gold Passport systemwide promotion and it's a good one! 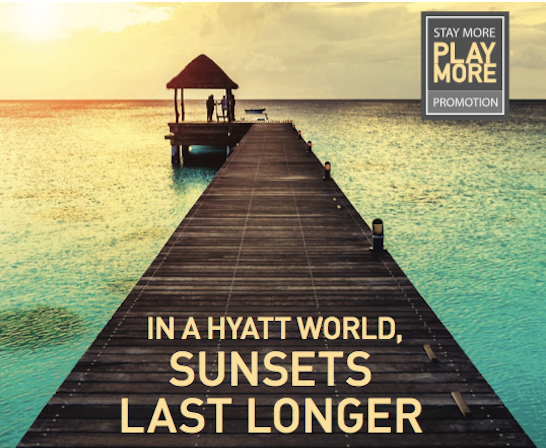 Finally a new Hyatt Gold Passport systemwide promotion and it's a good one! We haven't seen a systemwide bonus points promotion from Hyatt Gold Passport since last summer, nor have we even seen many individual hotel bonus offers outside of the more expensive double points rate so when One Mile at a Time broke this news yesterday, we were excited! The new promotion is called Stay More Play More will run from April 1 to June 30 with registration opening up on June 1. So start booking now to get your stays in! Keep an eye out here on RC as we'll re-post this when the registration link goes live!